Activists Take Fight to Obtain Hip,Knee Product Warranties to AAOS. Will They Succeed? 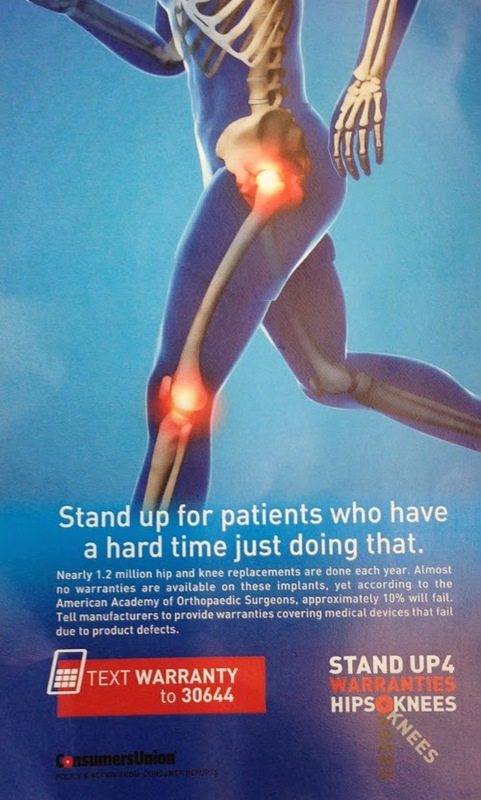 At AAOS, Consumers Union, through its Safe Patient Project, is asking surgeons to support their demand to obtain hip, knee warranties from device makers when implants fail early. A consumer advocacy group has seized upon the fairly mundane concept of product warranties to turn the heat on medical device makers. 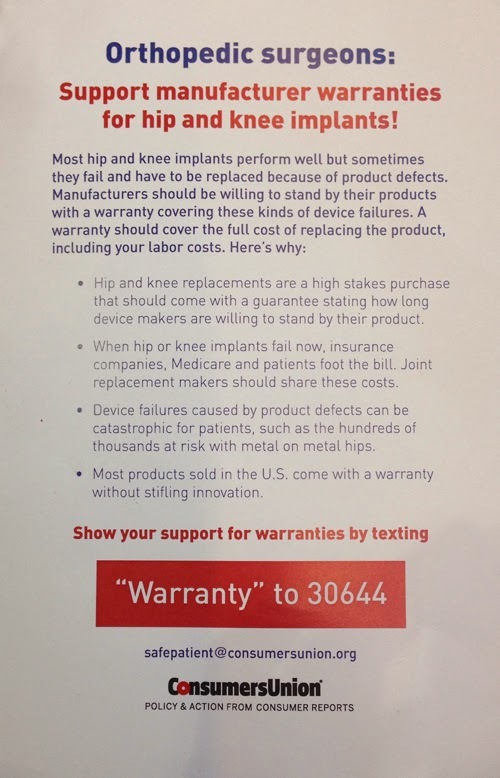 Consumers Union, the lobbying and advocacy arm of Consumer Reports, sent letters to six top hip and knee makers last September asking them to provide product warranties for early implant failures. The letter quoted the American Academy of Orthopaedic Surgeons in saying that 10% of implants fail. The group has now made a big push in publicizing its message by organizing a campaign outside the annual meeting of the American Academy of Orthopaedic Surgeons, which kicked off Tuesday and ends on Saturday, March 15. In an interview at AAOS Wednesday, Lisa McGiffert, director of Consumers Union’s Safe Patient Project, said that only Smith & Nephew formally responded to the letter sent to orthopedic manufacturers in September. Two others acknowledged receving the letter via email but never actually responded to the request. The others did not respond. McGiffert couldn't recall which two companies sent the acknowledgment. What the group is asking for is not unprecedented in the medical device world, she said. "Biomet provides a warranty for a partial knee and cardiac products have warranties," she said. After receiving Consumers Union's letter, Smith & Nephew responded that it is a "complicated issue" because hips and knees can fail for a number of reasons, McGiffert said. It could be the caused by the patient, the surgical technique or the device, McGiffert recalled the company as saying in its response. But McGiffert clarified that the group is focused on "when the products are the problem." In other words, Consumers Union is not looking for a blanket product warranty, but wants device makers to take responsibility and stand behind the products when device-related problems cause the joint replacement to fail. "You get warranties for flashlights, toasters and cars, for almost everything in the U.S.," she declared. "I know they are less complicated, but this is something that is going inside people's bodies. We think they ought to stand behind their products for a certain number of years. They can decide how long." The purpose to bring the campaign to AAOS is to win support from surgeons and get feedback from them, McGiffert said. However, Consumers Union may not win too much sympathy from the top brass at AAOS. In a phone interview Wednesday, outgoing AAOS president Dr. Joshua Jacobs said that the "vast majority of orthopedic implants for joint replacement perform exceedingly well - 90% of total joint replacements work 10, 15 years and beyond." Jacobs did acknowledge that "sometimes implants fail early, " but argued that "while warranties seem like a good idea on the face of it, the issue is more complex." Echoing McGiffert's portrayal of Smith & Nephew's response, Jacobs said that early failures could be caused by patients, due to the manner the surgeon did the procedure or it could be because of device problems. But sometimes "a complex interaction of the three" can also lead to early implant failure. So it may not be as easy to tease out which of the three factors caused the implant to fail. 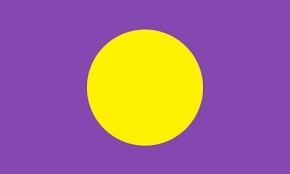 And then there is the potential for infection, which is out of everyone's control, that can contribute to a failure. "That cannot be addressed with a warranty," Jacobs declared. Overactive or obese patients can also lead to implant failure, Jacobs noted. However, another well-known orthopedic surgeon and healthcare social media maven, Howard Luks, disagreed with that assesment. "I don't think it's fair to blame the patient," he contended. "Once the joint replacement is done, it's stable, it's done. They should be ready to go. If the patient is obese, then why did you put it in? Device makers understand who these implants are going into and the implants should meet those needs. Or there should be a big red sticker on that says 'Do not put in a patient with a BMI over 30.' 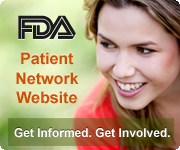 So I think the patients have a right to ask for a guaranty or a warranty on a product that is going in their body." Luks said that unless surgeons push the issue, device makers wouldn't move to provide such warranties. "We understand the position that Consumers Union has taken. We are interested in continuing to have a dialogue about this. But I think with joint replacements, it's a complex interaction of factors and revisions have sometimes to do with the implant, sometimes with the patients, sometimes with the technique. We acknowledged the letter but we haven't taken a position. This is an issue we are continuing to explore." Stryker declined comment via email. A Zimmer spokesman at AAOS said that "it's a complex issue and has a lot of factors surrounding it." The spokesman, James Gill, also forwarded a statement from AdvaMed, the device industry association, which argued that warranties for hip and knee implants that involve complex procedures and involving many different players, involving the patient and the hospital, may not be appropriate. However, it left the decision to provide warranties to individual manufacturers. Submitted by falascoj on March 14, 2014 - 9:32am. I've forwarded this article to numerous groups as an example of a publication actually getting out in front of the biggest deception on the American public since the Warren Commission. NEW ORLEANS -- An appearance by Louisiana governor Bobby Jindal (R) is among the highlights of this year's annual meeting of the American Academy of Orthopaedic Surgeons, which begins here Tuesday and runs through Saturday. Jindal will address the meeting on Wednesday. He is a former assistant secretary of the Department of Health and Human Services, as well as former secretary of the Louisiana Department of Health and Hospitals. AAOS President Joshua J. Jacobs, MD, is also excited about the 825 papers, 569 posters, 217 instructional courses, and more than 88 scientific exhibits being presented at this year's meeting. Live streaming of 13 symposia via webcasts will be available on demand through March 23. Featured symposia to catch either in person or via webcast include "Lessons on the Outcomes of ACL Reconstruction Surgery from International Registries," "Tips, Tricks, and Technical Pearls," "Hot Topics and Controversies in Shoulder Surgery," "The Multiple Ligament Injured and Dislocated Knee," and "Complex Skeletal Reconstruction in Infection, Post Trauma, and Tumor." A last-minute addition to the schedule, the "Health Care Reform: How Can We Adapt?" symposium, will start at 8:00 a.m. on Friday. At the same time, "Can We Improve Surgical Outcomes for Orthopaedic Patients? A Compelling Need for Change," will be moderated by James H. Herndon, MD, of Massachusetts General Hospital in Boston. There will also be "Ask an Expert" sessions for attendees to pick the brains of leaders in hip and knee, spine, hand and elbow, trauma, shoulder, tumor, foot and ankle, hand, pediatric, and sports medicine orthopedic surgery. A special electronic skills pavilion will provide attendees with a chance to learn about the latest technology and applications to help further their practice. Several presentations will focus on social media, managing reputations on the Internet, marketing, and privacy in the realm of medical health apps. The AAOS tradition of hosting a Guest Nation will continue this year, with France as this year's guest. 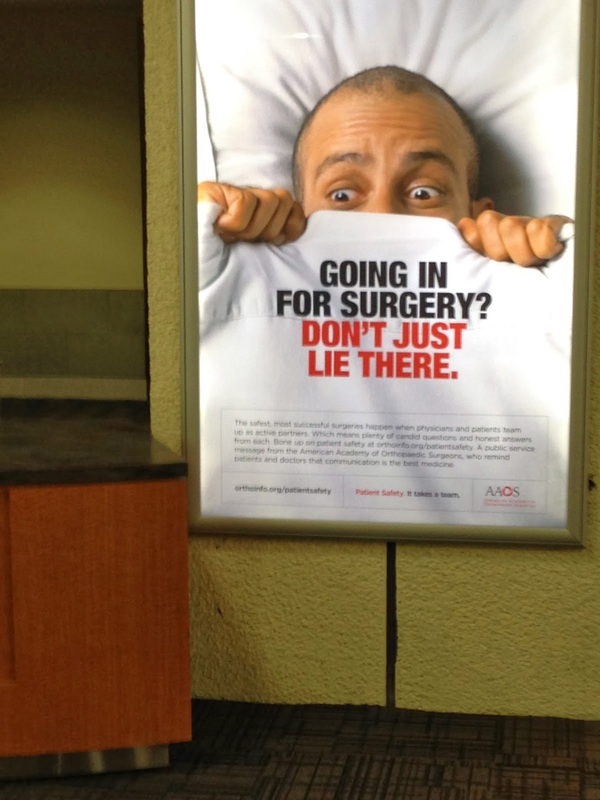 The text reads: The safest, most successful surgeries happen when physicians and patients team up as active partners. Which means plenty of candid questions and honest answers from each. 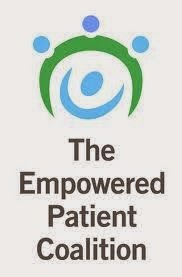 Bone up on patient safety at orthoinfo.org/patientsafety. A public service message from American Academy of Orthopedic Surgeon, who remind patients and doctors that communication is the best medicine. Knee Replacement Marketed to last 30 years: where is the warranty? Smith and Nephew Verilast Knee Replacement commercial.